For the nuclear test, see Hardtack Teak. Teak (Tectona grandis) is a tropical hardwood tree species placed in the flowering plant family Lamiaceae. Some forms of teak are known as Burmese teak, Central Province teak (CP teak), as well as Nagpur teak. T. grandis is a large, deciduous tree that occurs in mixed hardwood forests. 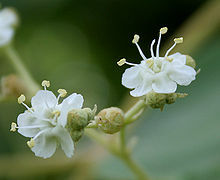 It has small, fragrant white flowers arranged in dense clusters (panicles) at the end of the branches. These flowers contain both types of reproductive organs (perfect flowers). The large, papery leaves of teak trees are often hairy on the lower surface. Teak wood has a leather-like smell when it is freshly milled and is particularly valued for its durability and water resistance. The wood is used for boat building, exterior construction, veneer, furniture, carving, turnings, and other small wood projects. Tectona grandis is native to south and southeast Asia, mainly India, Sri Lanka, Indonesia, Malaysia, Thailand, Myanmar and Bangladesh but is naturalised and cultivated in many countries in Africa and the Caribbean. Myanmar's teak forests account for nearly half of the world's naturally occurring teak. Molecular studies show that there are two centres of genetic origin of teak: one in India and the other in Myanmar and Laos. The English word teak comes from Tamil tekku (தேக்கு), Telugu teku (టేకు), Malayalam thekku (തേക്ക്), Sinhala thekka (තේක්ක), and Kannada tega (ತೇಗ) via the Portuguese teca. In Bangladesh and West Bengal, the species is known as segun (সেগুন). Central Province teak and Nagpur teak are named for those regions of India. Teak is a large, long, deciduous tree up to 40 m (131 ft) tall with gray to grayish brown branches. These are mostly known for their finest quality wood. Leaves are ovate-elliptic to ovate, 15–45 cm (5.9–17.7 in) long by 8–23 cm (3.1–9.1 in) wide, and are held on robust petioles which are 2–4 cm (0.8–1.6 in) long. Leaf margins are entire. Flowers at Ananthagiri Hills, in Rangareddy district of Telangana, India. Fragrant white flowers are borne on 25–40 cm (10–16 in) long by 30 cm (12 in) wide panicles from June to August. The corolla tube is 2.5–3 mm long with 2 mm wide obtuse lobes. 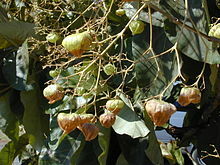 Tectona grandis sets fruit from September to December; fruits are globose and 1.2-1.8 cm in diameter. Flowers are weakly protandrous in that the anthers precede the stigma in maturity and pollen is shed within a few hours of the flower opening. The flowers are primarily entomophilous (insect-pollinated), but can occasionally be anemophilous (wind-pollinated). A 1996 study found that in its native range in Thailand, the major pollinator were species in the bee genus Ceratina. Heartwood is yellowish in colour. It darkens as it ages. Sometimes there are dark patches on it. There is a leather-like scent in newly cut wood. Sapwood is whitish to pale yellowish brown in colour. It can easily separate from heartwood. Wood texture is hard and ring porous. Density varies according to moisture content: at 15% mc it is 660 kg/m3. Tectona grandis was first formally described by Carl Linnaeus the Younger in his 1782 work Supplementum Plantarum. In 1975, Harold Norman Moldenke published new descriptions of four forms of this species in the journal Phytologia. Moldenke described each form as varying slightly from the type specimen: T. grandis f. canescens is distinguished from the type material by being densely canescent, or covered in hairs, on the underside of the leaf, T. grandis f. pilosula is distinct from the type material in the varying morphology of the leaf veins, T. grandis f. punctata is only hairy on the larger veins on the underside of the leaf, and T. grandis f. tomentella is noted for its dense yellowish tomentose hairs on the lower surface of the leaf. Tectona grandis is one of three species in the genus Tectona. The other two species, T. hamiltoniana and T. philippinensis, are endemics with relatively small native distributions in Myanmar and the Philippines, respectively. Tectona grandis is native to India, Sri Lanka, Indonesia, Myanmar, northern Thailand, and northwestern Laos. Tectona grandis is found in a variety of habitats and climatic conditions from arid areas with only 500 mm of rain per year to very moist forests with up to 5,000 mm of rain per year. Typically, though, the annual rainfall in areas where teak grows averages 1,250-1,650 mm with a 3-5 month dry season. Teak's natural oils make it useful in exposed locations, and make the timber termite and pest resistant. Teak is durable even when not treated with oil or varnish. Timber cut from old teak trees was once believed to be more durable and harder than plantation grown teak. Studies have shown that plantation teak performs on par with old-growth teak in erosion rate, dimensional stability, warping, and surface checking, but is more susceptible to color change from UV exposure. The vast majority of commercially harvested teak is grown on teak plantations found in Indonesia and controlled by Perum Perhutani (a state owned forest enterprise) that manages the country's forests. The primary use of teak harvested in Indonesia is in the production of outdoor teak furniture for export. Nilambur in Kerala, India, is also a major producer of teak of fine quality, holds the world's oldest teak plantation. Teak consumption raises a number of environmental concerns, such as the disappearance of rare old-growth teak. However, its popularity has led to growth in sustainable plantation teak production throughout the seasonally dry tropics in forestry plantations. The Forest Stewardship Council offers certification of sustainably grown and harvested teak products. Propagation of teak via tissue culture for plantation purposes is commercially viable. Teak plantations were widely established in Equatorial Africa during the Colonial era. These timber resources, as well as the oil reserves, are at the heart of the current (2014) South Sudanese conflict. Much of the world's teak is exported by Indonesia and Myanmar. There is also a rapidly growing plantation grown market in Central America (Costa Rica) and South America. With a depletion of remaining natural hectares of teak forests, a growth in plantations in Latin America is expected to rise. Hyblaea puera, commonly known as the teak defoliator, is a moth native to southeast Asia. It is a teak pest whose caterpillar feeds on teak and other species of trees common in the region of southeast Asia. Teak's high oil content, high tensile strength and tight grain make it particularly suitable where weather resistance is desired. It is used in the manufacture of outdoor furniture and boat decks. It is also used for cutting boards, indoor flooring, countertops and as a veneer for indoor furnishings. Although easily worked, it can cause severe blunting on edged tools because of the presence of silica in the wood. Over time teak can weather to a silvery-grey finish, especially when exposed to sunlight. Teak is used extensively in India to make doors and window frames, furniture, and columns and beams in old type houses. It is resistant to termite attacks and damage caused by other insects. Mature teak fetches a very good price. It is grown extensively by forest departments of different states in forest areas. Leaves of the teak wood tree are used in making Pellakai gatti (jackfruit dumpling), where batter is poured into a teak leaf and is steamed. This type of usage is found in the coastal district of Udupi in the Tulunadu region in South India. The leaves are also used in gudeg, a dish of young jackfruit made in Central Java, Indonesia, and give the dish its dark brown color. Teak is used as a food plant by the larvae of moths of the genus Endoclita including E. aroura, E. chalybeatus, E. damor, E. gmelina, E. malabaricus, E. sericeus and E. signifer and other Lepidoptera including Turnip Moth. Teak has been used as a boatbuilding material for over 2000 years (it was found in an archaeological dig in Berenice Panchrysos, a port on the Indian Roman trade). In addition to relatively high strength, teak is also highly resistant to rot, fungi and mildew. In addition, teak has a relatively low shrinkage ratio, which makes it excellent for applications where it undergoes periodic changes in moisture. Teak has the unusual properties of being both an excellent structural timber for framing, planking, etc., while at the same time being easily worked, unlike some other similar woods such as purpleheart, and finished to a high degree. For this reason, it is also prized for the trim work on boat interiors. Due to the oily nature of the wood, care must be taken to properly prepare the wood before gluing. When used on boats, teak is also very flexible in the finishes that may be applied. One option is to use no finish at all, in which case the wood will naturally weather to a pleasing silver-grey. The wood may also be oiled with a finishing agent such as linseed or tung oil. This results in a pleasant, somewhat dull finish. Finally, teak may also be varnished for a deep, lustrous glow. Teak is also used extensively in boat decks, as it is extremely durable and requires very little maintenance. The teak tends to wear in to the softer 'summer' growth bands first, forming a natural 'non-slip' surface. Any sanding is therefore only damaging. Use of modern cleaning compounds, oils or preservatives will shorten the life of the teak, as it contains natural teak-oil a very small distance below the white surface. Wooden boat experts will only wash the teak with salt water, and re-caulk when needed. This cleans the deck, and prevents it from drying out and the wood shrinking. The salt helps it absorb and retain moisture, and prevents any mildew and algal growth. Over-maintenance, such as cleaning teak with harsh chemicals, can shorten its usable lifespan as decking. Due to the increasing cost of teak, various alternatives have been employed. These include purpleheart, iroko, and angelique. Teak is propagated mainly from seeds. Germination of the seeds involves pretreatment to remove dormancy arising from the thick pericarp. Pretreatment involves alternate wetting and drying of the seed. The seeds are soaked in water for 12 hours and then spread to dry in the sun for 12 hours. This is repeated for 10–14 days and then the seeds are sown in shallow germination beds of coarse peat covered by sand. The seeds then germinate after 15 to 30 days. Clonal propagation of teak has been successfully done through grafting, rooted stem cuttings and micro propagation. While bud grafting on to seedling root stock has been the method used for establishing clonal seed orchards that enables assemblage of clones of the superior trees to encourage crossing, rooted stem cuttings and micro propagated plants are being increasingly used around the world for raising clonal plantations. Ministry of Environmental Conservation and Forestry (Myanmar) found the world's two biggest living teak trees on 28 August 2017 in Homalin Township, Sagaing Region, Myanmar. The biggest one, named Homemalynn 1, is 27.5 feet (8.4 m) in girth and 110 feet (34 m) tall. The second biggest one, named Homemalynn 2, is 27 feet (8.2 m) in girth. Previously, the world's biggest recorded teak tree was located within the Parambikulam Wildlife Sanctuary in the Palakkad District of Kerala in India, named Kannimara. The tree is approximately 47.5 metres (156 ft) tall. In 2017, a tree was discovered in the Ottakallan area of Thundathil range of Malayattoor Forest Division in Kerala with a girth of 7.65 metres (25.1 ft) and height of 40 metres (130 ft). A teak tree in Kappayam, Edamalayar, Kerala which used to be considered the biggest, has a diameter of only 7.23 meters. The International Teak Information Network (Teaknet) supported by the Food and Agriculture Organization (FAO) Regional office for Asia-Pacific, Bangkok, currently has its offices at the Kerala Forest Research Institute, Peechi, Thrissur, Kerala State in India. Teaknet is an international network of institutions and individuals interested in teak. Teaknet addresses the interests of all the categories of stakeholders related to teak, whether they are growers, traders, researchers or other groups with a profound interest or concerned with teak. From time to time, the organisation formulates action plans focusing on the short term and long term needs of the global teak sector. The TEAKNET website provides information to all those concerned with research, conservation, growing, management and utilisation of teak. Grades of teak include First European Quality (FEQ). ^ "Tectona grandis L.f. — The Plant List". www.theplantlist.org. ^ "GRIN Taxonomy for Plants - Tectona". United States Department of Agriculture. 5 October 2007. Retrieved 22 September 2013. ^ William Feinberg. "Burmese Teak: Turning a new leaf". East By South East. Retrieved 20 September 2015. ^ Verhaegen, D.; Fofana, Inza Jesus; Logossa, Zénor A; Ofori, Daniel (2010). "What is the genetic origin of teak (Tectona grandis L.) introduced in Africa and in Indonesia?". Tree Genetics & Genomes. 6 (5): 717–733. doi:10.1007/s11295-010-0286-x. ^ Vaishnaw, Vivek; Mohammad, Naseer; Wali, Syed Arif; Kumar, Randhir; Tripathi, Shashi Bhushan; Negi, Madan Singh; Ansari, Shamim Akhtar (2015). "AFLP markers for analysis of genetic diversity and structure of teak (Tectona grandis) in India". Canadian Journal of Forest Research. 45 (3): 297–306. doi:10.1139/cjfr-2014-0279. ^ "teak - Origin and meaning of teak by Online Etymology Dictionary". www.etymonline.com. ^ "Trade and Marketing". Food and Agriculture Organisation of the United Nations. Retrieved 6 September 2015. ^ a b c Tectona grandis. Flora of China 17: 16. Accessed online: 17 December 2010. ^ Bryndum, K. and T. Hedegart. 1969. Pollination of teak (Tectona grandis Linn.f.). Silv. Genet. 18: 77-80. ^ Hasluck, Paul N (1987). The Handyman's Guide: Essential Woodworking Tools and Techniques. New York: Skyhorse. pp. 174–5. ISBN 9781602391734. ^ Porter, Brian (2001). Carpentry and joinery. 1 (Third ed.). Butterworth. p. 54. ISBN 9781138168169. ^ "Plant Name Details for Tectona grandis". International Plant Names Index (IPNI). International Organization for Plant Information (IOPI). Retrieved 17 December 2010. ^ Moldenke, H. N. 1975. Notes on new and noteworthy plants. LXXVII. Phytologia, 31: 28. ^ Tewari, D. N. 1992. A monograph on teak (Tectona grandis Linn.f.). International Book Distributors. ^ Kaosa-ard, A. 1981. Teak its natural distribution and related factors. Nat. His. Bull. Siam. Soc., 29: 55-74. ^ Williams, R. Sam; Miller, Regis (2001). "Characteristics of Ten Tropical Hardwoods from Certified Forests in Bolivia" (PDF). Wood and Fiber Science. 33 (4): 618–626. ^ KRFI.org. "Teak Museum: Nilambur". Web Archive. Archived from the original on 28 September 2006. Retrieved 20 September 2015. ^ "Teak - TimberPlus Blog". 7 July 2014. ^ "Is all well in the teak forests of South Sudan? – By Aly Verjee". 14 March 2013. ^ "Elma Wood". elmawood.com. Archived from the original on 16 August 2013. ^ Central American Timber Fund. "Investing in Teak: The Market". Central American Timber Fund. Retrieved 20 September 2015. ^ Herbison-Evans, Don (6 September 2007). "Hyblaea puera". University of Technology, Sydney. Archived from the original on 24 July 2008. Retrieved 12 March 2008. ^ "Teak: A Dwindling Natural Resource - Teak Hardwoods". ^ Steven E. Sidebotham, Berenike and the Ancient Maritime Spice Route, Univ. of California Press, 2011. ^ a b Yachting. February 2004. pp. 46–. ISSN 0043-9940. ^ R. Bruce Hoadley (2000). Understanding Wood: A Craftsman'S Guide To Wood Technology – Chapter 6 pg.118. ISBN 9781561583584. Retrieved 14 October 2015. ^ Elmer John Tangerman (1973). The Big Book of Whittling and Woodcarving. Courier Corporation. pp. 180–. ISBN 978-0-486-26171-3. ^ MotorBoating. April 1912. pp. 38–. ISSN 1531-2623. ^ Hearst Magazines (March 1985). Popular Mechanics. Hearst Magazines. pp. 125–. ISSN 0032-4558. ^ a b The Woodenboat. J. J. Wilson. 2001. ^ Peter H. Spectre (1995). Painting & Varnishing. WoodenBoat Books. pp. 15–. ISBN 978-0-937822-33-3. ^ Azamal Husen. "Clonal Propagation of Teak (Tectona grandis linn.f." LAP Lambert Academic Publishing. Retrieved 20 September 2015. ^ Khin Su Wai (5 September 2017). "Sagaing Region may be home to world's largest teak tree". The Myanmar Times. Retrieved 26 September 2017. ^ a b "Mother of all Teak trees near Malayattoor". The New Indian Express. Retrieved 25 October 2018. ^ "TEAKNET - Online Teak Resources and News - International Teak Information Network". www.teaknet.org. Beach, Chandler B., ed. (1914). "Teak" . The New Student's Reference Work . Chicago: F. E. Compton and Co.
Tectona grandis in West African plants – A Photo Guide.